SUCCESSION PLANNING: WHO SHOULD TAKE THE REIGNS? Perhaps you’ve got one eye on retirement – but is handing over your business to a family member the best plan? For those of you who can still remember being a teenager, you may recall thinking that you would never get old, or if you were going to, it was so far off your radar. However, for those of us who are now of a certain age and can’t remember what being a teenager was like, then we are probably also at a point in our lives where planning for some form of retirement has become a consideration. Time passes and at some point there is the need to consider succession planning. So that the whole unfamiliar process doesn’t come as too much of a shock, I suggest you take an hour or so today to create a time-based action plan that you can come back to at a later point. From your current position, look ahead to decide what you want from the rest of your working life, when you would like to step down from running the business and most critically, if there is anyone who you would like to take the business over from you. 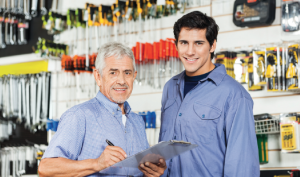 This may be a family member, or an existing employee, but whoever you may have in mind, it is absolutely critical that you consider their character traits and business expertise as a potential business owner and their ability to address the changing face of the aftermarket. Do not overlook loyal employees who may be able to take on the running of the business. If they are ignored in favour of an outsider, it may cause damage to your business from within. In most cases, it is likely that you will need to realise some value from your business, either as a direct sale to provide a ‘pension pot’, or as an on-going income stream as part of your retirement income. This is where it becomes much more critical to think things through. If you decide to sell the business (which is the ‘cleanest’ option), then there are two scenarios – firstly, sell on the open market where you will simply want to ensure the best price. In this case, work with your accountant to optimise your balance sheet, profitability and good will value at the time you plan to sell to ensure that the business looks as attractive as possible to a potential purchaser. Secondly, if it is sold to a family member, then there are many other considerations. The most critical is their motivation to take over the business, closely followed by their personal characteristics, experience and ability to actually run the business successfully to pay you the purchase price, particularly if this is over a period of time. I have experienced a successful business being sold to the founder’s son, only to fail through a combination of naivety, incompetence and the burden of trying to pay back the purchase price over the following years – a very real risk in many cases. This is especially important if you expect them to fund your retirement plans as an on-going concern. If a family member is going to run the business and pay you from future profits, then choose carefully, as unlike an employee, they would be harder to dismiss if they don’t perform. I would propose assessing against the 16 core competencies of the IMI’s Automotive Management Accreditation (AMA) scheme. In the likely event that some areas of their competencies are weak then help is available to support their development needs. This scheme is based on three increasing levels of management competency, providing the platform to support development as their experience levels grow. An initial on-line assessment is available from MIC Ltd, called AMA Trait that includes a one-to-one feedback session to provide a better understanding of the best development strategy. Finally, there are two other critical aspects to consider. Firstly, even for a family member, ensure that a formal contract is in place which details exactly what the transfer entails and when it will come into effect. This is necessary for complete clarity and to avoid future disputes. Secondly, there are capital gains tax liabilities on any profit you may generate on the sale. Although there is information on the HRMC website (the tax rate varies depending on the level of profit, so it is vital to discuss this with a specialist tax advisor). Overall, family succession can be a great solution for all concerned, but you may have to live with the consequences – possibly in the most literal sense ­– ensure that you plan carefully and take the necessary legal advice.